Is David Beckham Beginning To Lose His Hair? Belgravia Centre Hair Loss Blog > Blog > Hair Loss > Is David Beckham Beginning To Lose His Hair? As the new year fast approaches, speculation is rife as to where David Beckham will go next after he leaves LA Galaxy, the American club to which he has belonged since 2007. At the age of 37, he has already played for Manchester United and Real Madrid, and he is now faced with another potential move across the world to a new home for him and his family. Rumours circulate that he may swap coasts to New York where his wife, Victoria, has her fashion label, or even move back to London. Pictured at the 2012 Sports Personality Of The Year Awards this week, the footballer presented three lifetime achievement awards alongside the Duchess of Cambridge, in Kate’s first public appearance since her stay in hospital for chronic morning sickness. The pictures from the night indicate that the star might be beginning to experience a receding hairline. In comparison with a younger Beckham, the hair at the football star’s temples seems to have receded; a classic case of the onset of male pattern baldness, the most common condition behind hair loss. The cause of this is generally genetic, and as such cannot be prevented from happening. As his dad Ted is bald, it is likely that Beckham’s scalp hair follicles will be sensitive to the hormone DHT, which prevents healthy and strong hair from growing and eventually causes hair growth to cease altogether. This next step is why slowing the rate of baldness is vital, and if Beckham is yet to look into treating his hair loss, he should act now to treat the problem before it becomes more noticeable. It is also worth considering whether stress has played a part in his hair loss. If Beckham still has some whispy hairs at his temples. there’s a good chance that he could regrow the thinning areas. Our expansive collection of before and during treatment photographs illustrate just how effective a combined treatment plan can be for some men. 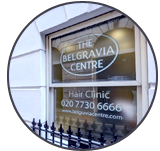 By providing a tailored course comprising clinically-proven topical and oral hair loss treatments, alongside key hair growth supporting products, Belgravia offers a discreet hair regimen perfect for those in the public eye – and out of it.